I just can’t get enough of the off-the-shoulder trend this season! I’ve already shared a glam boho look featuring a lace off-the-shoulder top. 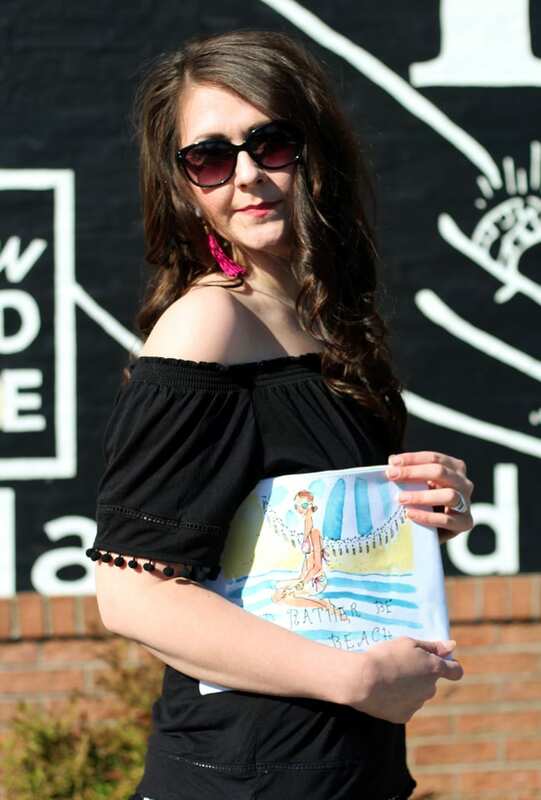 This trend is so fun and flirty for the hotter temperatures that are on their way. This black pom-pom top is actually another version of the lace one from my glam boho look–both are available at H&M for $9.99! That’s a great deal, especially considering that many of the off-the-shoulder tops I’ve seen run $50+ (eek!). You all know that I’m also love pom-pom details this season–the trim on this top is just perfect! For a wear-to-work look, just pull the sleeves up to cover your shoulders. That will allow you to take this look from the office to date night. 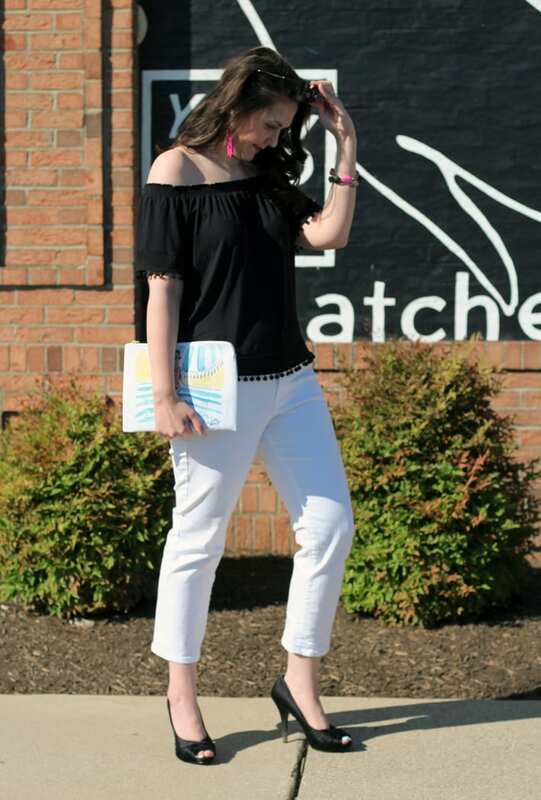 I paired this top with simple white cropped jeans for a classic look. 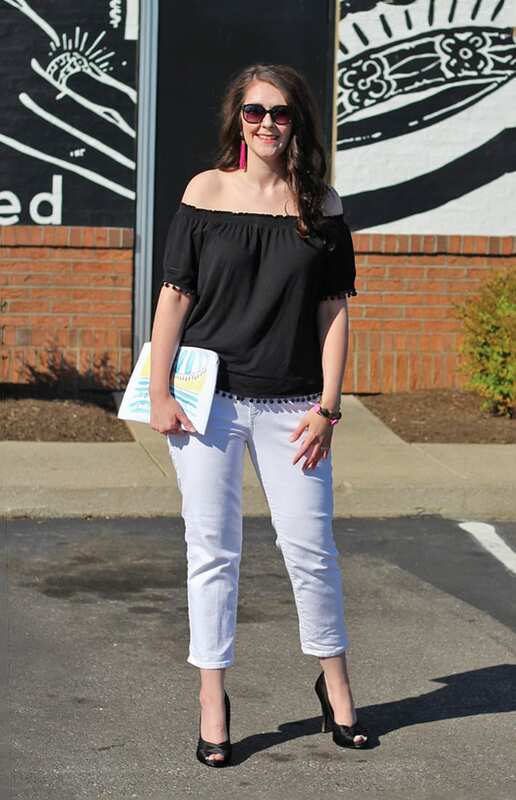 Sometimes I struggle finding white pants that aren’t see-through, but these are not! They have just the right amount of thickness. And it doesn’t show up in these pictures, but there’s the slightest amount of distressing that’s a couple of inches wide right by one of the front pockets. Let’s talk about these bangles for a minute! I’ve been on the search for the perfect abalone shell bangle for a while, and found it at the cutest Etsy shop called Courtney and Courtnie. 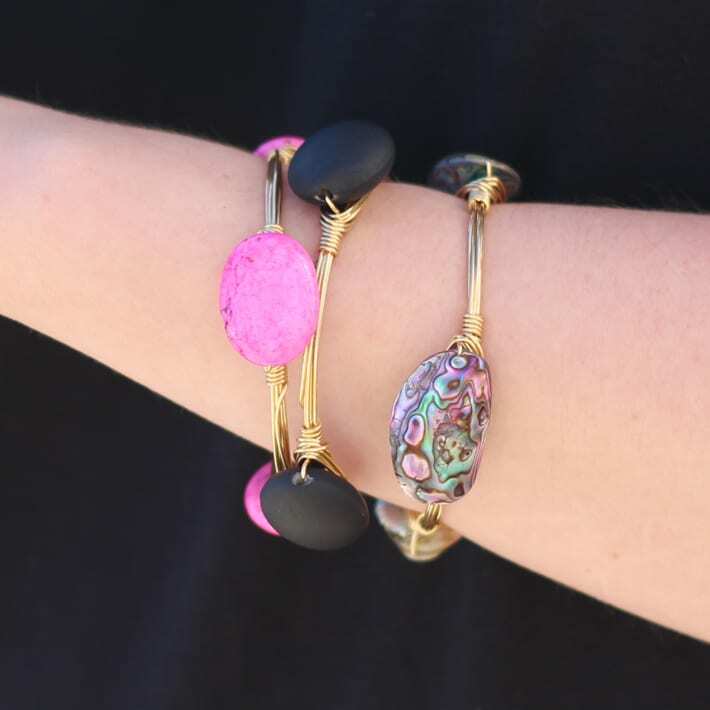 This shop has the cutest wire bangles that come in all sorts of colors and finishes! The bangles are some of the most affordable ones I’ve found, with most prices ranging between $11-$17. The quality is great and they come in a variety of sizes. I have tiny wrists, so I’m wearing the XS (7″) bangles. These would make a perfect Mother’s Day gift! The fun part is that I’ve actually teamed up with Courtney and Courtnie for an Instagram giveaway of a $45 credit to their shop!!! Head on over to my Instagram to enter to win. Look for the picture below! Be sure to check out my fresh face for spring routine, featuring an easy coral makeup look, and my gift guide for Mother’s Day!!! And if you like this post, please share it with your friends via the share buttons below! Do you have any idea of how jealous I am that you got the black pom pom top!?! I went looking for the white one you posted last week and H&M was sold out online and the store near us of the black one and they didn’t have the white in my size. I did sweet talk the hubby into going to the one 2 hours away this weekend. Fingers crossed they have them haha. I hope you find it! Call ahead and see if they can hold it for you if they do. What a cute top! Love the accessories you paired with it as well! Thanks, Cara! It’s such a fun look. Secret–I wore my normal bra and pulled the straps down! 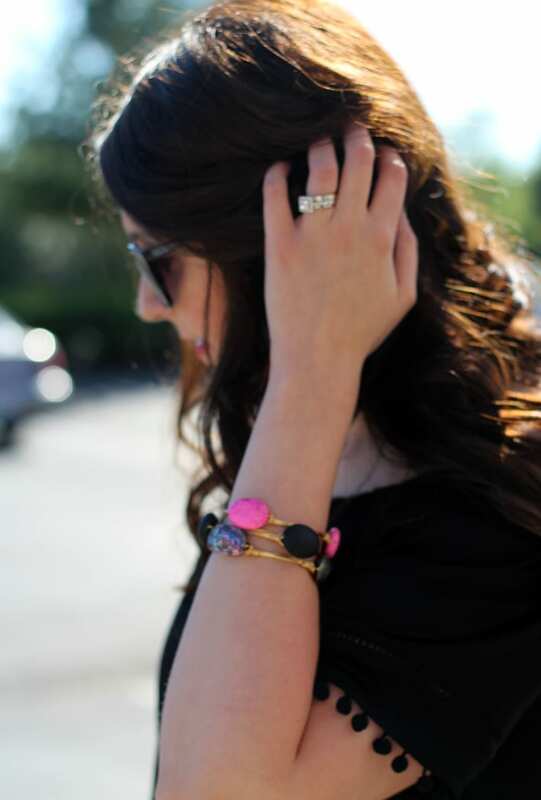 The pink and black is such a fun look! 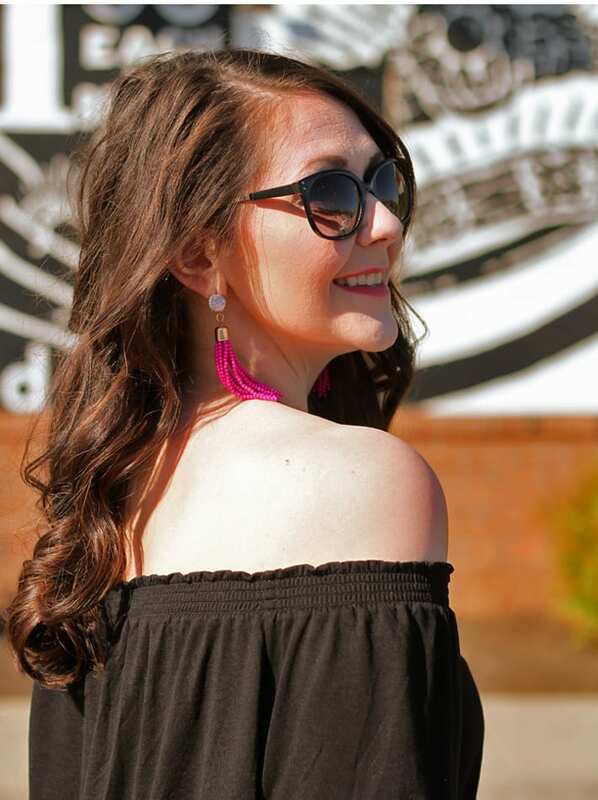 Love your earrings! Thanks, Becky! I’ve gotten so much wear out of those earrings! I love that top, I don’t have any off the shoulder stuff yet and I have been dying to try the trend. That price point is spot on! Love a cheap trend find! Love this look! Those bracelets are gorgeous and I love your clutch! you rocked it girl. Thanks, Sierra! I’m loving the bracelets. I’ve worn them almost every day since they came in the mail! I LOVE it! SO gorgeous, as always! I’m always a fan of black and white outfits and I’ve just got to add something with pom pom details to my wardrobe this season. I picked up a pretty throw pillow for my couch with pom poms so that’s a start right?!?! Totally a start! I hope you find a top you like! Another adorable off the shoulder top! Love the little pom pom detail! Those bracelets are gorgeous! I’ll have to check out her shop! 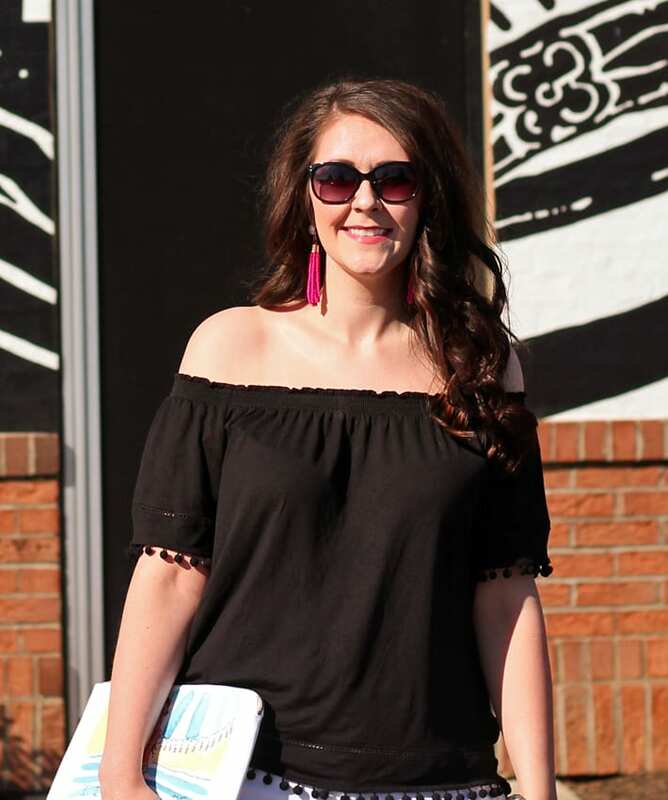 I also am featuring your boho glam off the shoulder look today for Thursday Fashion Files! I hope you can stop by and linkup this new look with us! Thanks, Jill! And I hoped over and linked up yesterday–I’ve been trying to be more mindful of remembering the Thursday linkups! For some reason, I always forget. Love this off-the shoulder top & what a steal from H & M! 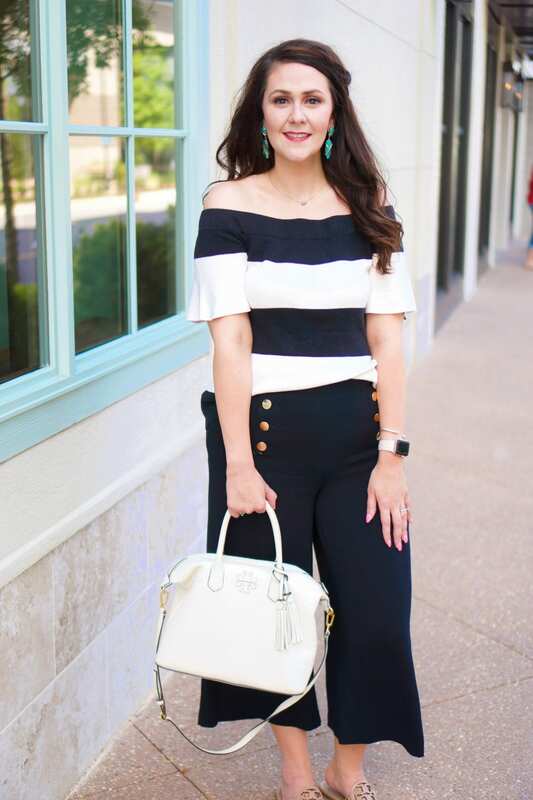 I’m such a fan of black & white looks in the spring and this outfit is adorable! Thanks, Marta! And I was so happy to find this $10 top! Stunning! I love everything about this look Tif. The off shoulder trend is definitely your signature style (or becoming that way). Thanks, friend! I want everything in it!